As the bulbs are flashing, hordes of fans are screaming your name together in unison. As you're walking through the tunnel, strangers are high-fiving you, randomly giving various versions of thumbs up cause let's face it, nobody really knows what to say when cheering on a celebrity about to perform to thousands of fans so it always comes out as some kind of awkward double thumbs up or "go get'em." They already know what you've done and expect greatness. And as the experienced professional you are...you give it to them in all your fabulous glory. Some bands performing actually get to experience that type of celebrity-ish admiration at the Bands of America Grand Nationals. Over the years, I've stood down in the tunnel trying to look like I'm doing something important with my ALL ACCESS pass (I know right? Me with ALL ACCESS? Imagine all the trouble I've gotten into...uh I mean COULD get into. Mooohahaha!) watching many of the well known bands set up in the same tunnel Hall of Fame NFL players walk out of. I'm usually doing this during Semi-Finals, which in my opinion is where the true suspense of the competition is. The well known bands are often greeted with cheers of encouragement, a lot of "Woos!" and yes, the ever so awkward but well intentioned Double Thumbs Up. What I've found is that the people who do this not only want to wish the band luck, but also want to feel connected to the band's great legacy from performances past. I get it. I've done it. The kids appreciate the gesture and are focused on getting the job done often giving the friendly eye-brow nod or slightly move the corners of their mouths indicating a silent thank you. I love their discipline and in a way, comfort level with what's going on. They've been there before. I've also witnessed (almost always during prelims) some little known bands in the tunnel preparing for their once in a lifetime experience to perform in a world class sports stadium for judges that are about as "pro" as it gets, and an audience who understands what they do. Usually there are not a lot of people around inside that tunnel as the group is small and doesn't have an army of helpers surrounding them. It's their first time there, so their director applies an extra layer of deodorant as to follow the rule "never let'm see you sweat." The tunnels of Lucas Oil Stadium can feel large and drafty when not filled. The sounds on the field are muffled by the architecture. The bands line up and the light from the open air creeps through the large opening that doesn't suddenly appear, but rather slowly transforms from covered tunnel to exposed stage. It's the moment before the moment. This past year, throughout the three-day long competition I either spent my time walking around listening to conversations around the concessions (Yes I know, creepy but it was for research I swear) for a little slice of life perspective around the marching arts or I watched bands and their many forms of celebration of their year's (sometimes many years') hard work. I was often tweeting away humorously inspiring thoughts on shows, trying to find their love and humor. Rarely am I caught off guard anymore. As Frank Zappa said, "All the good music has been written by people with wigs and stuff." But this year was slightly different. I had a special moment. Something that reminded me of the "education" part of music education. It reminded me that if I let my expectations get in the way of my perception, I'll miss something great. I'm so glad I didn't miss this. Sitting there after seeing a 300 piece band perform with everything short of pyrotechnics (don't get me wrong, I love fire in a show. In fact we need more fire in music education:) I began tweeting away. As I was about to hit the button to send my latest bit of wise-cracking humor off to cyber space, a band began coming onto the field. The band was small, but because of the goliath sized group before, it looked like a meal from one of those fancy restaurants with one carrot and one slice of meat. A thin slice. With weird sauce on it. Little did I know the meal would be worth every penny and be incredibly fulfilling. 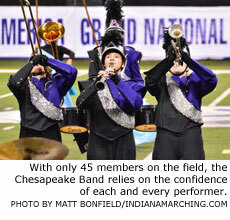 Chesapeake High School had 45 members. The drum line had two snares, one quad, and four bass drums. (It was the biggest section in the band if you count them together.) I came to find out later that three of the four bass drums were 7th or 8th graders. Two people in the front ensemble. Each of the other sections only had a few people at most including a spectacularly small guard. Then the announcement came that they were playing music by Aaron Copland. One of my favorites. There was something about this tiny group that was different. As I watched with my own idea of what to expect, I noticed how confident the group looked. Every player exposed. I could literally observe each individual person as they performed. And I did. There were moments of pure bravery such as a guard member with the most turquoise suspenders I'd ever seen (I kinda want a pair now) throw what had to be a five or six in dead silence with nothing else happening. He nailed it. A big spotlight for someone who was a tuba player in the group a year earlier. Or a small trombone section laying out a killer soli for everyone to hear. Or a player in a wheelchair at the front sideline rocking a rain stick (and clarinet) as if they were a professional rain stick player. I couldn't help but feel the delight emoted from the field of playing for the crowd. They captured my attention with not what they were doing but with who they were. And at the end of the show, they "dropped the mic" and slowly marched off the field with the best walk-off I'd ever seen. I didn't know what to do at first. Then it came to me and I stood up and clapped, but with the loud type clapping using the center of my hands, not the fingers to wrist clap you do when you're being polite. I let out a few "Whoos" in my best falsetto and for some reason gave a fist pump. I swear that was the first fist pump I've ever done. I mean who does fist pumps anymore? I didn't know what else to do to show my excitement for this group. There must have been maybe a few hundred people in the stands. Definitely not the thousands you'd see at Finals, but you wouldn't have guessed it by the way they performed. I raced over to the band as they were taking their picture in the end zone and grabbed the director. I let him know I would love to learn about the group and share their story. He looked at me with puzzlement and said, "We're just a little band from Ohio." I know. And I loved it. I was able to connect with their director Chris Wyscarver over the phone a week later. One of the things that impressed me the most was his historical knowledge of the program he now helms. The band was 100-plus people in the 1980s. He shared the ups and downs of the decades to the point where he took over the group in 2004. There were 27 kids in the band. Chris did what any good director does, had fun while trying to make good sounds. Being successful with parades and fun shows at first, the group eventually was given a competitive goal, make state finals with a superior rating. 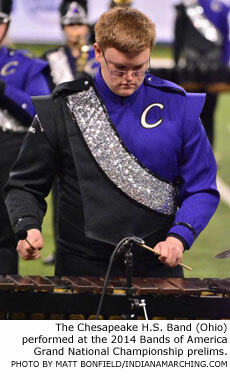 To help, Chris had music customized for the small marching machine and focused on fundamentals. Forty-five kids was enough if everyone did their part. And they did. They made their superior ratings and felt the need to reach further to what Chris called, "The highest level of performance competition there is...BOA." He wanted to give the kids, "the opportunity to walk out with world class judges" telling them how to get better. "It's not about the score. It's about showing off." The band had the support of a world class booster group who works EVERY sports event in the concession stand so the money will go to help the band program. They pay for all the instruments and drum heads needed. "The parents don't ever go home. They have an incredible commitment to the kids." The Village of Chesapeake is a rural community with a population of 736. * The band was in the tunnel at BOA to follow a 300-piece band. They knew they were very exposed. They lost five players in the middle of the season. For a group of 50, that's huge. There was lots to be scared about. Being at Grand Nationals was no accident. They had been preparing for years qualifying for state numerous times and participating at many local shows always keeping in mind their hunger to be great and refusal to accept mediocrity. Getting ready for their big moment, they remembered the rehearsals where they would scream, "With Pride!" as loud as any 300-piece band. Their director would add, "Be you" at the end of it. And as they walked out the tunnel to perform slightly intimidated by the moment, their director reminded them of where they came from. "Just be Chesapeake," he said. And they were. About the Author: DJ Corchin is a music education advocate and author of the celebrated humorously inspiring Band Nerds book series including Band Nerds Poetry From The 13th Chair Trombone Player, The Marching Band Nerds Handbook, and Band Nerds Confessions & Confusion. You can follow his blog The13thChair.com to catch his thoughts in real time. He was a featured performer in the first national Broadway tour of the Tony and Emmy award winning show, BLAST! where he was best known as the "unicycling trombonist." Now living and working in Chicago as a children's author, his other publications are available world wide and include Sam & The Jungle Band, You Got A Boogie, I Feel... Children's Book Series, and ThunderFeet. A former high school band director, he continues to be involved in marching bands and music education through speaking events, competitions, and organizations such as Music for All. Mr. Corchin welcomes your comments via email. For more of his work please visit www.djcorchin.com. Mr. Corchin is an independent contributor so his views and opinions do not necessarily represent those of Marching.com. * According to the 2013 Census. Text by DJ Corchin. 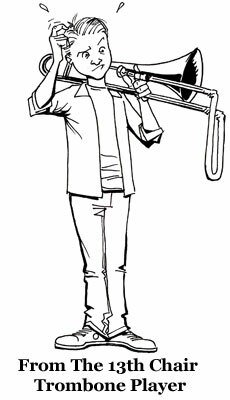 Trombone illustration by Dan Dougherty. Chesapeake Band photos by Matt Bonfield/IndianaMarching.com.